This will be my mom's first Mothers Day in a nursing home. I want to make something special as a door decoration - she keeps the door open all the time so she will be able to see it a lot. She will be 100 this year but is still Very alert!! Any suggestions? Thanks so much! I have made her several quilts and a wall hanging so want to do something a little different. I have a Welcome door hanger on my front door with buttons. I made little quilts to change out each month. I would start her first button on quilt with a Happy Mother's Day applique one. 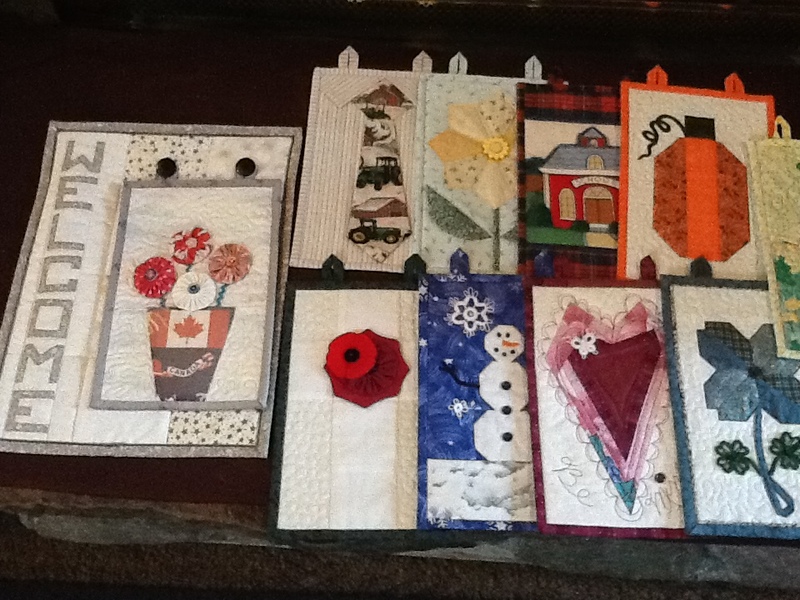 Maybe a mini-quilt wall hanging with yo-yo flowers? If you Google “yo-yo flowers” you can find pictures and patterns. Maybe something bright, cheery and small. My Mom was in a nursing home for some time and it seems that she liked anything with flowers and bright colors. Good luck and I am sure someone on this board will give you some great ideas. Make something that you know she will love. If she was a flower person ... then something of that sort. Or did she love cats? dogs? Was she a quilter? what was her favourite quilt pattern? Then choose it. Likewise pick colours that are hers!! Ideally bright and perky, so she can see them from afar. might be closer and easier for her to see and enjoy, than on the door. Mine go on my front door in the sun so they have faded. first of each month. It made her room special to those coming & going. She loved them. You could make one for Mother's Day & then add one each month, since it is so close to Mother's Day. In reference to the above monthly hangings. What a lovely idea. I wish I had thought of this when my DM and DMIL were in nursing homes. I would like to make something like this for myself, or perhaps as gifts for others. Thank you for the idea. Last edited by humbird; 05-06-2018 at 06:56 AM. I like the monthly wall hanging idea ... or at least seasonal. You wouldn't have to do them all at once, of course. Wow Tartan! Those are just awesome. Are those all your own designs? Wonderful idea!! I just looked for a fun idea I wanted to do for each month. The only one I used a paper pieced pattern for was the heart. The others I made up as I went or used a cute fussy cut fabric for. Tartan, I showed your Welcome sign to my hubby. He really liked it so I am making a set for his mother and mother for Christmas. Very clever idea because it can be personalized. Door hangers are a great idea! Tartan, Those are adorable and perfect for each month. Another free pattern that can be changed with the seasons. Great plan to update every month, relieves boredom with same old, same old and she’ll get sweet compliments on it. Mothers are so very special and almost daily it’s “wish I could ask Mom” or “that’s something I should tell Mom”. This conversation brings back memories for me. Door decor was important to my mom. I joked to mom "maybe she didn't want door decor up anymore?" "Oh no... That's how I know where I live." She was right, it was true, she was having more frequent and longer spells of confusion and dementia, it probably was more difficult for her to differentiate which was her door, they all do look alike. I was able to find mom cute door decor at JoAnn's or Michaels. I made things to hang on a wall by her bed for my Aunt while she was in a nursing home. Machine embroidered her name on each item. She loved them and looked forward to each one. What a great idea for a nursing home door. I like to change out a welcome type hanging on my screened front porch every month or so, and found the Patchabilities patterns quick and easy and they seem to have one for every interest and season. I don't have any connection to them except just love their little patterns. Here is a link to their website in case you don't want to develop your own patterns. Thanks to everyone for your responses! I can definitely come up with something from these suggestions and web sites. Jordan's comment about anything with flowers and bright colors made me think of my Flower Basket wall hanging I have in my sewing room. There are a few yo yo flowers. Happy 100th bday to your mother. 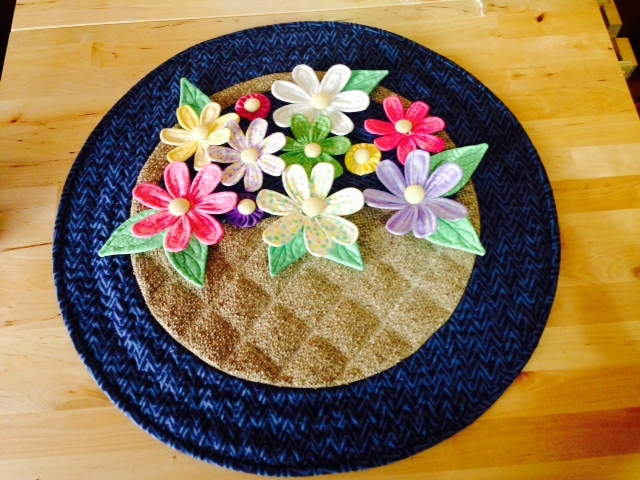 Super Member, that is a beautiful Flower Basket wall hanging! Do you remember the pattern name? What a cute idea. I might need to make some for myself. I like the dimensions of your wall hanging vs. a larger one. Would you share the dimensions, by any chance? I think the door hanger is a fabulous idea. But how do you attach it to the door at the home ? typically, they are covered with laminate.